Connection is now allowed for TA100C and AC100C to transfer data by using the USB cable. 1. The Employee Time Card will now be displayed in a bigger font size. 3. 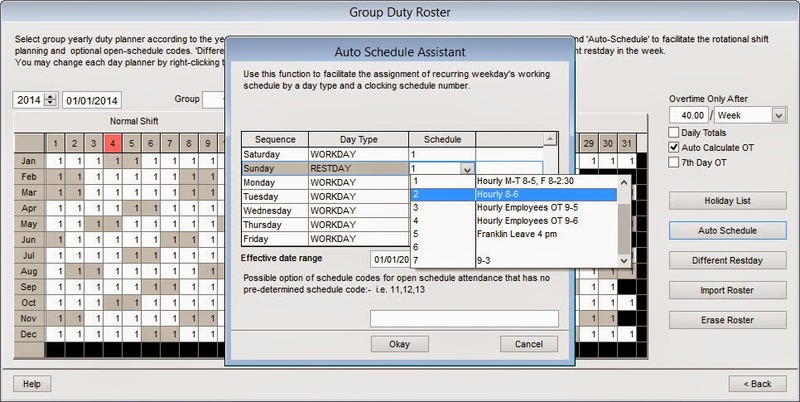 Enhanced schedule code selection popup in Group Duty Roster. 4. 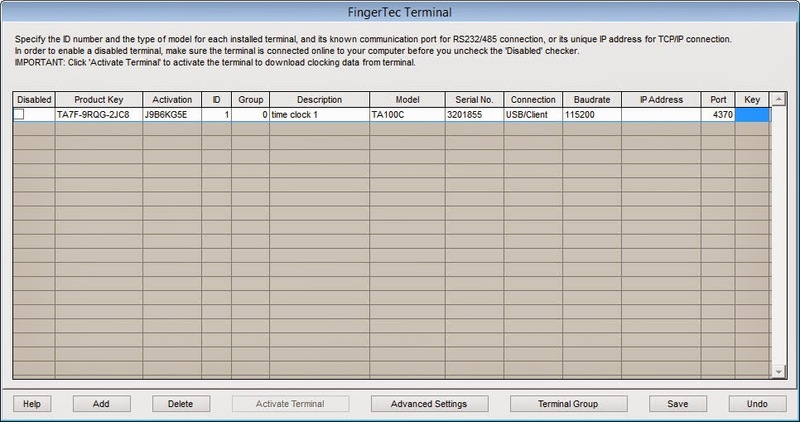 Detected and displayed the model name TA100 or TA100C during software activation. 6. 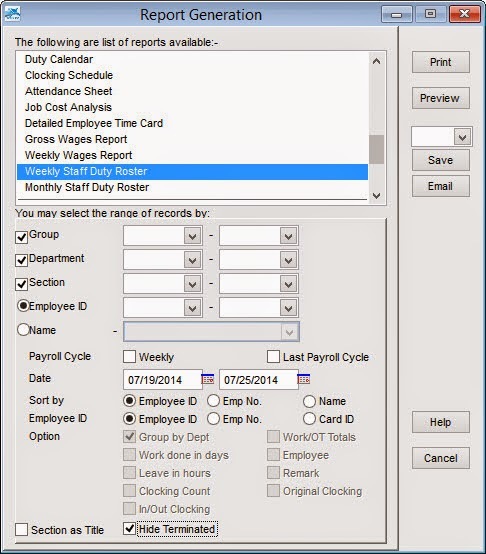 The revised reports will now display work hours in different time formats. 9. The Job Cost Analysis report has been revised in landscape. 10. The term Supervisor privilege is now changed to SuperAdmin. 1. The group time zone has been updated in R2. 3. Attendance data to UBS payroll can now be posted. 4. Time format while displaying total working hours in Gross Wages report. 5. Date time format in Terminal Transaction Listing report. 6. Report to print in hh:mm format. 8. The colour of the printing to turn red for late-in for electronic time card. 9. 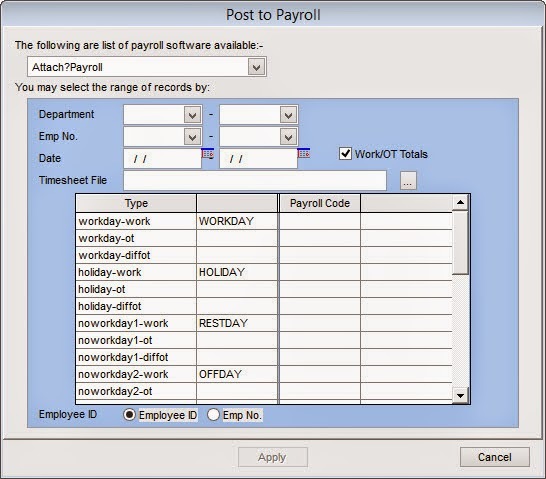 Export employee ID option for Attaché payroll. 10. Auto send report in XLS-Data format. 11. Total work time in Electronic time card and Attendance Summary. 12. Save reports into XLS single file with multiple pages. 13. 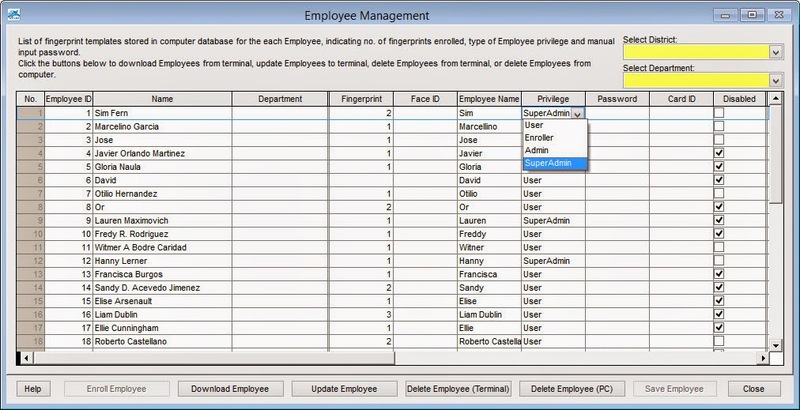 Save reports with large data size into XLS. 14. Delete PC Employee (PC) face template. 15. Change ID under data audit list. 17. 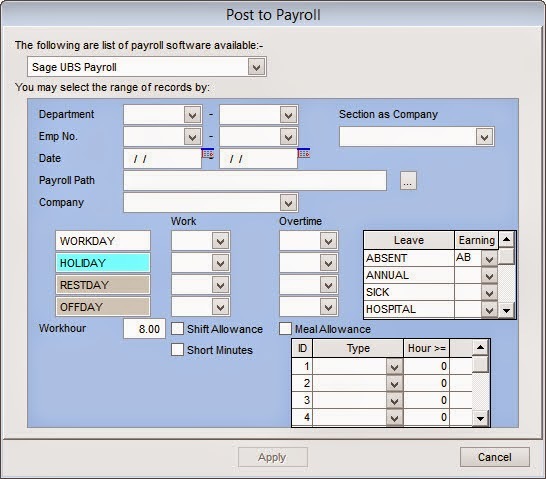 Post to MYOB payroll format. 18. Export attendance summary of total late hour in proper hour minute format. 19. Weekly Staff Duty Roster with proper weekday column heading. 20. Export number of leave taken in detail and summary. 21. Group duty roster for new calendar year. 22. Export to XLS format with selected language column header. pls. provide remark field in import leave records window for importing leave data from excel or other format . Will feedback your requirement to our R&D and announced it if this feature is available. Please add a remark field in employees tab for adding reason for leaving terminated employees. Auto send report in XLS-Data format. Save reports into XLS single file with multiple pages. Suggestion for India business environment - Half day leave criterion based on number of hours worked. In the meantime, you still can key in leave in hours in Staff Extended Leave.